Orcas have been a centerpiece of the SeaWorld parks since shows at the Shamu stadium in San Diego became the main draw in the 1970s. 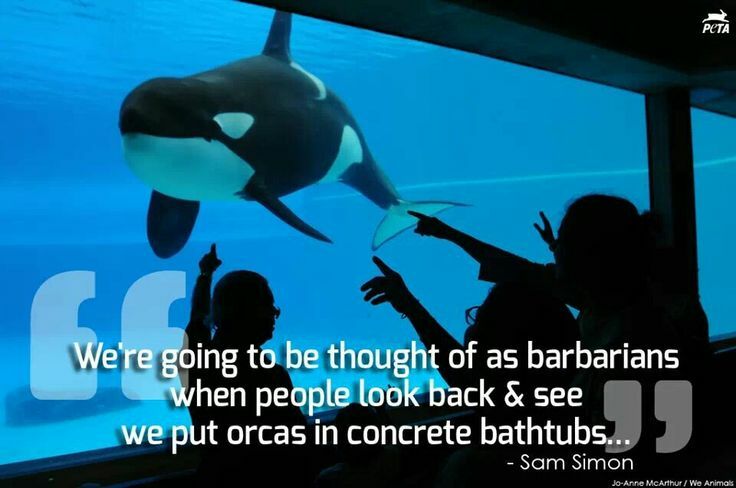 But criticism has steadily increased in the decades since and then became sharper after an orca named Tilikum battered and drowned trainer Dawn Brancheau after a "Dine with Shamu" show in Orlando in 2010. Her death was highlighted in "Blackfish," and it wasn't the first for Tilikum. The whale also killed an animal trainer and a trespasser in the 1990s. Oh, A-drey-drey - what do you like? I like ... er ... give me a second ... I like ... hating ... things. Especially people. So, there. I came up with something I like. Now, back to the hate. Humans are despicable monsters, and the concept that they keep captive wild animals for their own amusement and call it "education" or "rescuing" proves my point about the baseness of human nature. I can forgive kids for not getting it. Marketing from unscrupulous adults makes kids believe brine shrimp are humanoid mer-people smiling in their own plastic aquatic kingdom. If a seal balances a ball on its nose or a killer whale lets someone ride on its back, it must be having spontaneous fun, right? Adults should know better, but humans have a boundless capacity for lies and self-deception. As is typical with me, it is not some humanist appeal that drives me to support a seemingly leftist cause. It is my misanthropy. I am criticizing human behavior, not sticking up for animal welfare. I don't give a crap about the welfare of these animals in the wild. If a whale beaches itself, the only reason to push it back out to sea is if you don't want its rotting carcass to stink up your beach. If a human wants to save the whale for its own sake I see that as egotistical do-gooder meddling. If a human wants to keep that whale in a tank and teach it to do tricks, that human is a monster for having such a bizarre inclination. I cannot comprehend why anyone would want to do such a thing. That others will pay to see the captive whale do tricks indicates that humans are a bunch of dangerously deluded mental defectives with too much time on their krinkled hands.